Luxury Villa with Amazing Views! Pool and Hot Tub! 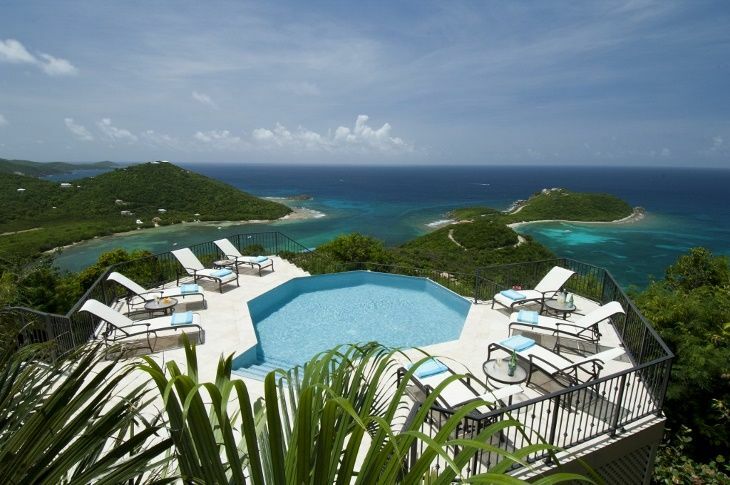 Located in the exclusive enclave of Point Rendezvous on the south shore of St. John, Island Rider is a fully renovated villa that sits upon the open breezy hillside above Klein Bay with sprawling verandas that overlook the gentle curves of Rendezvous Bay and Ditliff Point. This beautifully appointed four bedroom home holds all of the charm of the old St. John with beautiful stone work while providing all of the modern amenities one could expect in a luxury home including a fabulous solar heated pool and spa. This villa sets the standards in modern vacation accommodations with a state of the art gourmet kitchen and open dining room for entertaining, as well as a separate media room to relax in for a night of watching movies. The spacious open plan living area opens to spectacular views south on one side and an expansive covered patio for grilling in back. There are four distinct outdoor seating areas that accommodate 8 guests for meals: The Veranda, Courtyard, Pool Deck and Lower Spa Deck. Designed to be the ultimate personal retreat, Island Rider is the perfect getaway for friends or families with adult children. Located just five minutes from Cruz Bay, it has convenient access to town and the North Shore beaches but still provides the seclusion you want for your island getaway. Island Rider will offer you a vacation you will never forget. All rates are based upon number of guests. Rates quoted on HomeAway are for the maximum number of guests. Smaller groups will receive an adjustment to their rate. Weekly Rates: High Season 2 persons: $7,400 4 persons: $8,600 6 persons: $9,800 8 persons: $11,000 Low Season 2 persons: $6,200 4 persons: $7,400 6 persons: $8,600 8 persons: $9,800 Thanksgiving: $9,800 Christmas/ New Year’s: $13,200 Additional charges include 12.5% VI Room tax, non-refundable $50 Security Deposit Waiver Fee and $50 Reservation Fee.